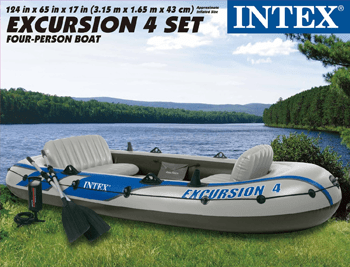 If you and your family share a passion for boating and fishing, the Intex Excursion 4 boat is perfect for you. 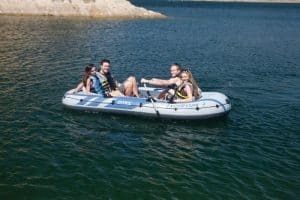 One of the most dependable inflatable vessels around, it will be more than capable of servicing your boating and fishing needs. Constructed from rugged vinyl and sporting an I-Beam flooring, this boat comes packed with all the bells and whistles you’d expect from a boat meant for fishing. A couple of fishing rod holders, inflatable seat cushions, oar holders and even fittings for mounting a motor so you can focus on fishing and fishing alone – all this at an astonishing price. Durable construction: Made from durable vinyl, this boat is ready to take on the wear and tear from the sun and water and serve you for years on end. The I-beam floor further enhances the rigidity and comfort of the boat. A user who tested the boat in rocky waters and rough beaches reported that it survived without a scratch. Low cost: At just $134.12, this boat is ideal for the family which has just started with fishing and boating, and doesn’t want to make a huge investment in case they don’t enjoy it. Made for fishing: With features such as motor fittings, rod and oar holders and inflatable cushions, it seems that the manufacturers have crafted this vessel specifically for those who go for fishing in groups. Large weight carrying ability: With a carrying capacity of 880 pounds, this vessel can easily sustain the weight of four fisherman and still have room for gear and catch. Easy to deflate/inflate: Incorporates Boston valves so you can quickly and easily inflate and deflate the vessel. It comes with its own high output hand pump which you can replace with an electric pump of your own if required. 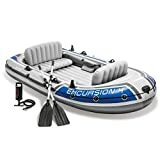 Easy to carry around: The Intex Excursion 4 person boat has a weight of 49.8 pounds (gear included) so that it can easily be carried by two adult kayakers. Moreover, the gear pouch it comes with allows it to easily be transported in the trunk of a car. Troublesome Boston valves: Some people can find it hard to open the Boston valves which can quickly become irritable. The visible seams that protrude externally can detract from the otherwise great look of the boat. The carry bag isn’t really the best quality out there and the gear bag doesn’t have a zipper. The default grab line it comes with isn’t top of the line either – you’d do well to replace it. To sum it up, this boat is every dollar worth its cost (which isn’t that much to begin with) and should definitely be considered by those who want to enjoy some casual boating in calmer waters. Its cost may be low, but it doesn’t compromise on quality where it matters most – making it perfect for those on a budget.